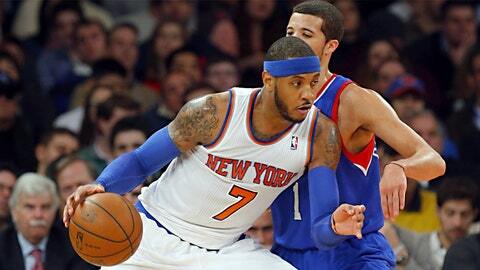 Carmelo Anthony could exercise his opt-out clause with the Knicks this summer. Carmelo Anthony has been the face of the New York Knicks since he arrived to Madison Square Garden during the 2010-11 season, but with the franchise nowhere near competing for an NBA championship, the 29-year-old forward may choose to test free agency this summer. Anthony has an opt-out clause in his contract, and according to Adrian Wojnarowski of Yahoo! Sports, the Knicks superstar prefers the Chicago Bulls over the Los Angeles Lakers if he becomes a free agent. "Within the past several weeks, a longtime confidant of Carmelo Anthony confesses, something changed. Never did he believe there was a chance Anthony would leave the New York Knicks — never the Madison Square Garden stage, never the $129 million contract extension," writes Wojnarowski. "Only now, the gloom of the Knicks’ season — the uncertainty of the franchise’s future — left that man to believe it’s possible Anthony could leave New York in free agency. "’Chicago is much more in play for him than L.A.,’ the source said." Even though the Knicks are able to offer Anthony more money than any other team in free agency, they aren’t well-positioned to be among the league’s elite over the next three-to-five seasons. New York’s roster lacks good young talent, and because of the trade with the Nuggets three years ago that brought Anthony to the Big Apple, Denver has the Knicks’ first-round pick in 2014 and the right to swap first-rounders in 2016, per RealGM. The only hope for the Knicks to build a winner is through free agency, but given Anthony’s lack of playoff success and the incredible amount of pressure to win that players face on a daily basis in New York, signing the top players on the market is no guarantee. The Knicks had the salary cap space to sign LeBron James from the loaded 2010 free-agent class, but they failed to acquire him and settled for Amare Stoudemire â who wasn’t among the top four players available that summer. The upcoming free-agent class could include Miami Heat stars Dwyane Wade, Chris Bosh and James — all of whom have early-termination options in their contracts. Other unrestricted free agents include Los Angeles’ Pau Gasol, Cleveland’s Luol Deng and Indiana’s Lance Stephenson. Even with his future beyond this season uncertain, Anthony’s focus must remain on the Knicks’ playoff push. Despite being 16-27, they are just two games behind the Charlotte Bobcats for eighth place in the Eastern Conference. If New York could climb as high as the sixth seed, a second straight second-round appearance would be a realistic goal.